The Spokane Chiefs (30-19-2-5) seek revenge Saturday against the Tri-City Americans (33-21-2-1) after a loss on in Kennewick last Saturday. 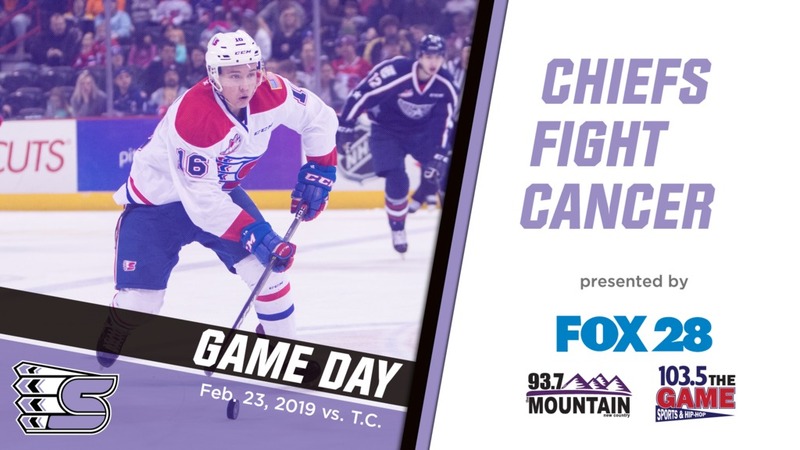 It will be Chiefs Fight Cancer Night with the first 5,000 fans through the gates taking home a rally towel modeled after the special cancer awareness jerseys the Chiefs’ players will be wearing throughout the game. Fans will have the opportunity to bid on the game-worn jerseys throughout the game with proceeds benefiting Every Women Can. Gates open at 4:00 p.m. Saturday night as all fans with a ticket to the Chiefs-Americans game are invited to attend the Spokane Police Department-Tri-City Police Department hockey game prior to the Chiefs game, with puck drop coming at 5:00 p.m..